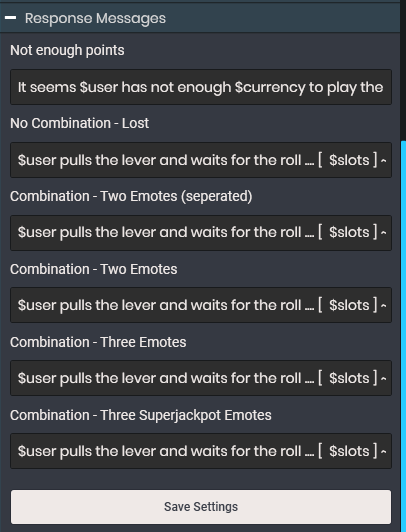 Slots is a simple chat based slotmachine game where you can decide which emotes are being used and set for each type of result a seperate payout and response message from the bot. Allowed are global emotes from Twitch and BetterTwitchTV as well as your channel BTTV and Twitch subscriber emotes (keep in mind that your bot needs to be a sub to your channel to be able to use sub emotes). 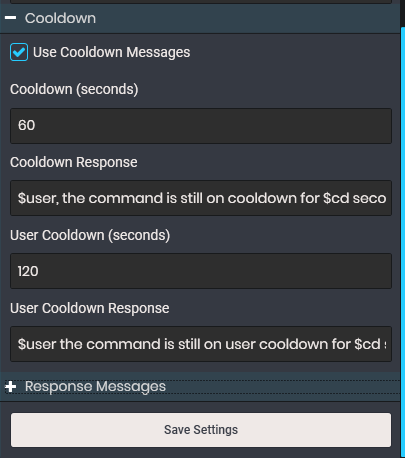 To prevent spam in your chat you’re also able to set a global as well as user cooldown with seperated responses from the bot. Note: The more emotes you add to this game the less is the chance of a winner.